My nephew loves chocolate and I love making him happy, so I thought I’ll make him some brownies, some Chewy Gooey Eggless Brownies! 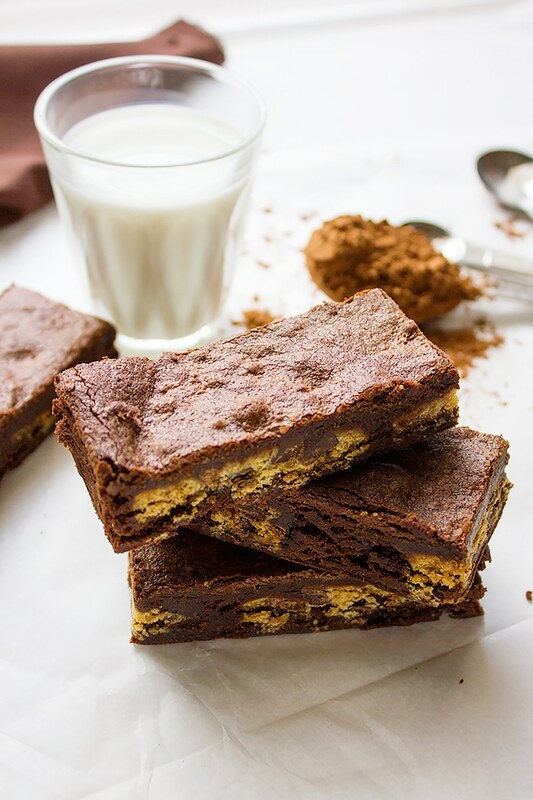 Making Chewy Gooey Eggless Brownies is a breeze. That day I knew how considerate my nephew is and he made me feel proud of him.What he didn’t know is that I’ve never made eggless brownies before and this will be a challenge. 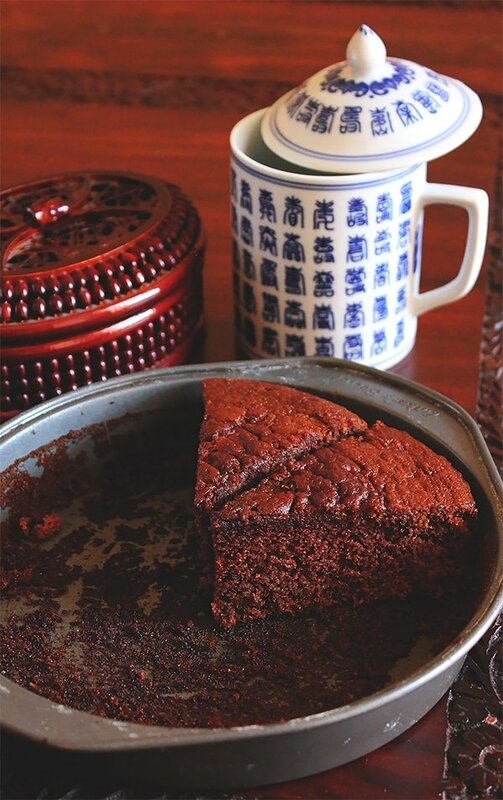 I really wanted him and his friend to enjoy this dessert and decided to work hard and give my best in making delicious eggless brownies. This recipe (after few modifications) worked like a charm. I was so happy to introduce it to my nephew’s friend. The feedback made me humble, everyone loved my Chewy Gooey Eggless Brownies and not only that, but the most important part was that my nephew’s friend didn’t feel left out, that was my prize. 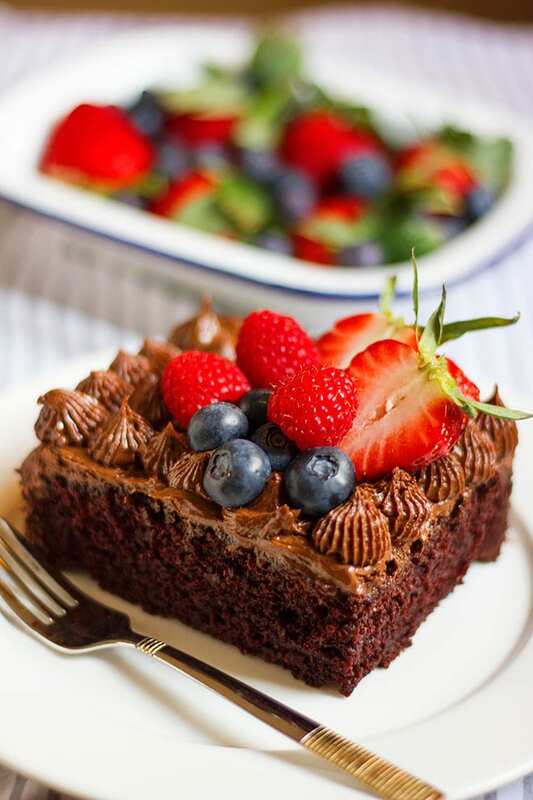 I am sharing this recipe here for everyone to enjoy the best and most asked for dessert with family and friends. 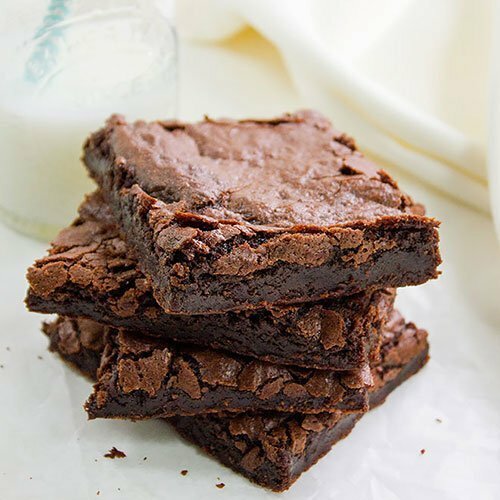 This recipe is for a very gooey, chewy, and chocolaty brownies. Made in 8×8 inch square nonstick pan. If you are crazy about chocolate you’ll enjoy it, but if you like lighter taste of chocolate, maybe you should use milk chocolate chips. 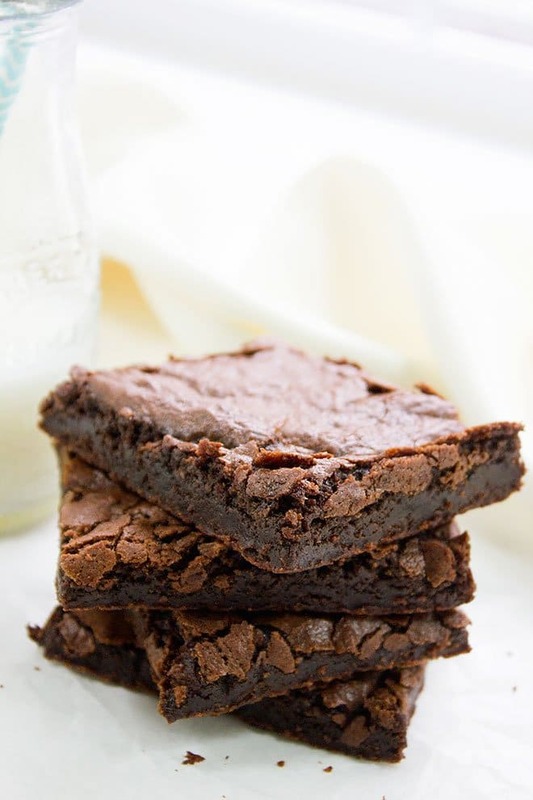 Make sure to spread the brownie dough evenly in the pan otherwise the brownie will not rise evenly. Do not over mix the dough. Sift the flour with baking powder at least twice to make sure that the baking powder is mixed well. Preheat oven to 350F/180C. Line 11"x8" or “8x8” pan with parchment paper and keep aside. In a bowl, sift the flour, baking powder, baking soda, and salt. 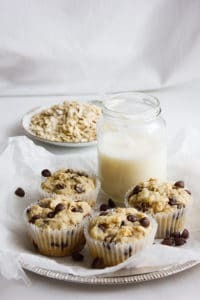 In a microwavable bowl, add the chocolate chips and butter. Melt in the microwave and set aside. In a different bowl, add the sugar, banana, two tablespoon hot water, vanilla, and the chocolate mixture. Whisk well. Add the flour mixture to the already mixed wet ingredients and stir until well combined. Don't over mix. Pour the mixture in the previously prepared baking pan. Gently tap the baking pan on the table to remove bubbles if formed and even the surface. Bake the brownies for 25 minutes, or until a toothpick comes out with very few crumbs. 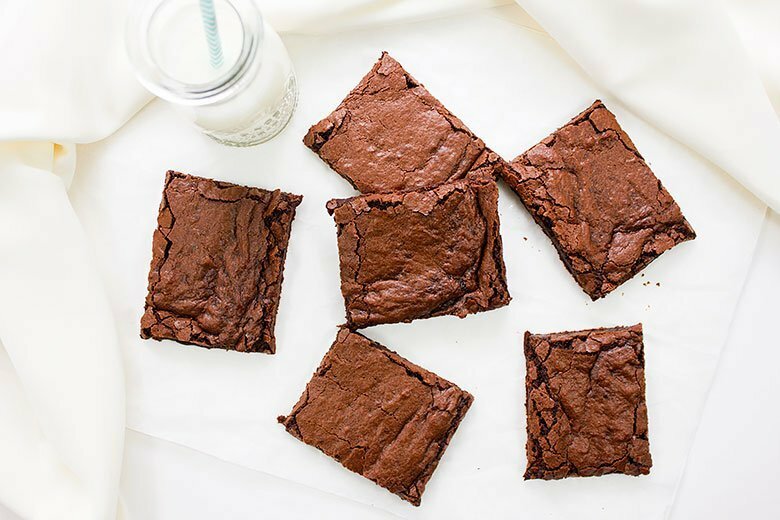 Leave the brownies to cool in the baking pan. Don't touch the surface of the brownies. When it cools, refrigerate it for an hour before cutting it. My son, his stomach, and his friends’ stomachs thank you so much. This delicious dish made a kid feel like he belonged. Vow just want to have a bite.I will try this and get back very soon. 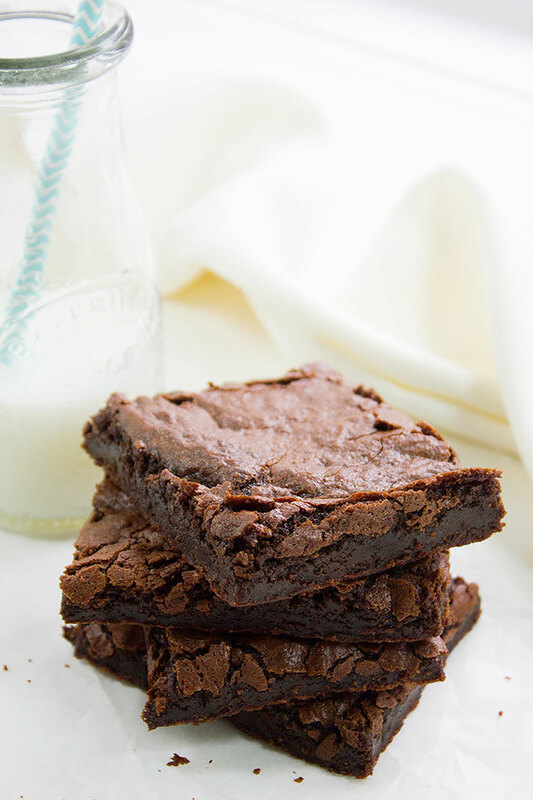 whoa … your eggless brownies look so very moist and divine! They look divine! My first time here, thank you for this recipe, both my girls are allergic to eggs and do miss out on all the good things! I’ll make these next week for my son’s birthday so they can enjoy it too! Am following you on Google Connect, hope to see you soon on my site! Looking forward to sharing! Those brownies look terrific! What perfect texture. @Roxana, it’s nice to have you here, glad you liked the brownies, I look forward to making more egg free dishes! I made the brownies today because my nephew is allergic to eggs. Mine didn’t come out as beautifully glossy on the top as yours, but they were definitely chocolately, moist and chewy. 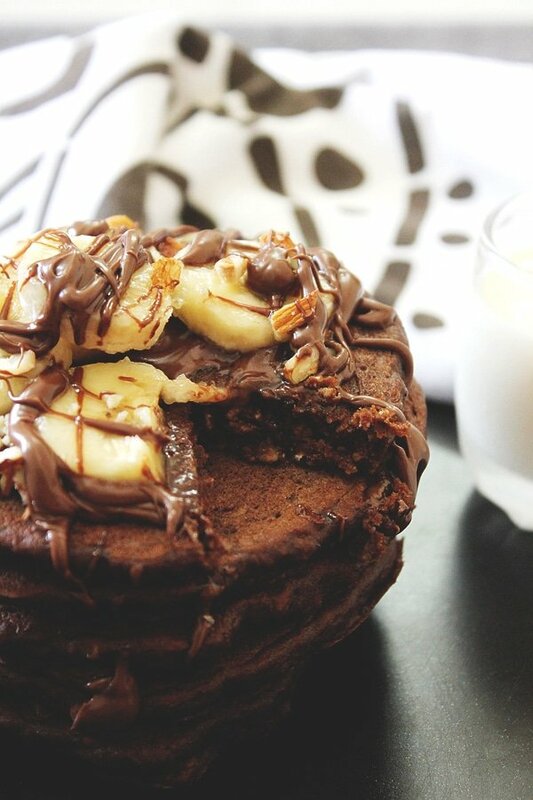 We found that we could definitely taste and smell the banana in them, but we love banana, so that was a plus. Thanks for the recipe! These are the best brownies I’ve ever had. Someone in my house is allergic to eggs, so I will be saving this recipe for sure! It should be half cup. 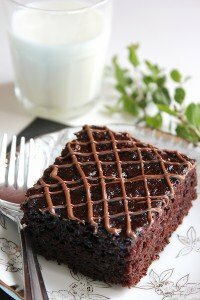 Found your wonderful recipe while googling for an eggless version of choco brownie! i tried it out for a house party on saturday and it was a major hit! thanks a lot for the recipe..it would be great if you could point me out to more of ur eggless recipes (i.e. if you have any).Thanks in advance! Hi, I’m happy that my eggless brownies were a hit! 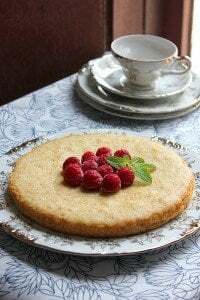 There are few Indian desserts which are eggless like gajar ka halwa and rasgulla, there is a recipe for shortbread too. 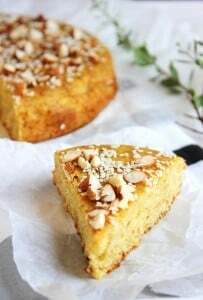 Hi Mariam, I’m glad you and your family enjoyed my recipe, There are more eggless desserts on my blog now, and I hope you give it a try. I mostly think of kids when I make a dessert, since I know that some of them can’t have everything because of allergies. 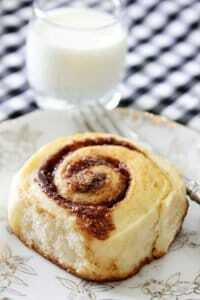 Am making these right now! Batter tasted a little bitter though. Hopefully they turn out great! Hi, your receipe is wonderful. Only thing I want to ask that can we use anything else instead of banana (like vinegar or curd or..) ..? 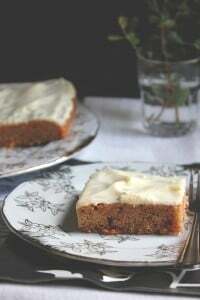 Hi Anar, I never used anything other than bananas for this recipe. 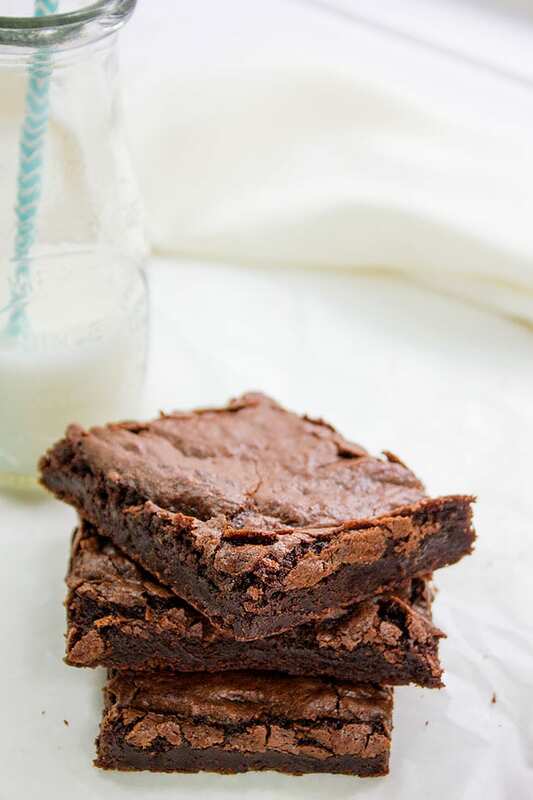 hello I have been trying eggless brownie recipes for a long time now…i have an 11 yr old son who is allergic to eggs and trying to find a decent “close to real brownie” recipe has been quite the adventure! 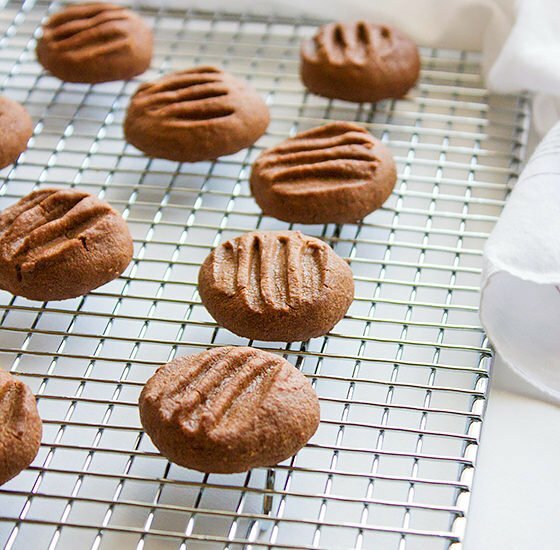 One recipe i “almost” loved was made with black beans pureed. The reason i say almost is because the bean skin though pureed with a professional food processor was still somewhat noticable. I decided today when i found your recipe to sub the banana out with White cannellini bean puree.the rest of the recipe i kept as is. They are cooking right now, and smell heavenly. Hoping they come out as wonderful as yours look. will update you 🙂 thanks for sharing your recipe! Hi wat is the cup measurements u have used? 200 or 250 ml? Hi Rithika, one cup is 240ml, so half is 120ml. You can puree medium size pealed apple and use it instead. 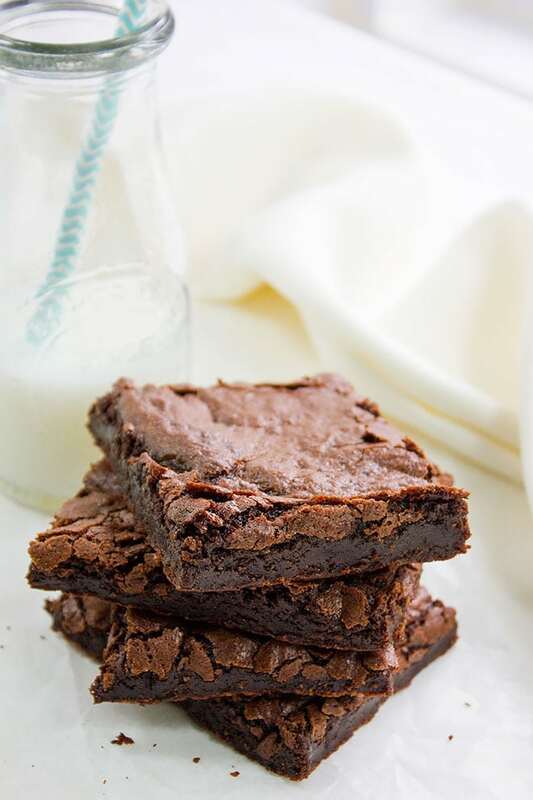 I’ve tried brownie recipes before, all in vain. And then I came across your recipe. It’s excellent. The brownies came out better than expected. I do have a query, though. The first batch was made in a 8*8 pan and I made the second batch in a brownie tray. In the first batch a little patch in the middle fell down, as in fell flat. And in the brownie tray all the brownies fell flat in the middle. Any idea why this might have happened? Do you feel it might have been the soda? Thank you once again for the awesome recipe. This one is for keeps. God bless you! Hi Medha! This usully happens if you over mixed the brownie batter or have opened the oven door before ten minutes were up or if the oven wasn’t hot enough. Thank you! I think it might have been the over mixing. Because the oven was hot enough and I did not open the door too soon.. 🙂 Will try with less mixing. Thanks again. Hi the recipe sounds delish. However,beside apple sauce or any pureed fruit, can you suggest a sub for banana? I didn’t use anything else so far, these pureed fruits give a good texture to the brownies, not sure if something else works! Hey Mitali, if you use very ripe bananas, you will taste the flavor in the brownies, otherwise there is always a light hint of banana in the brownies which one can ignore unless you really hate bananas! 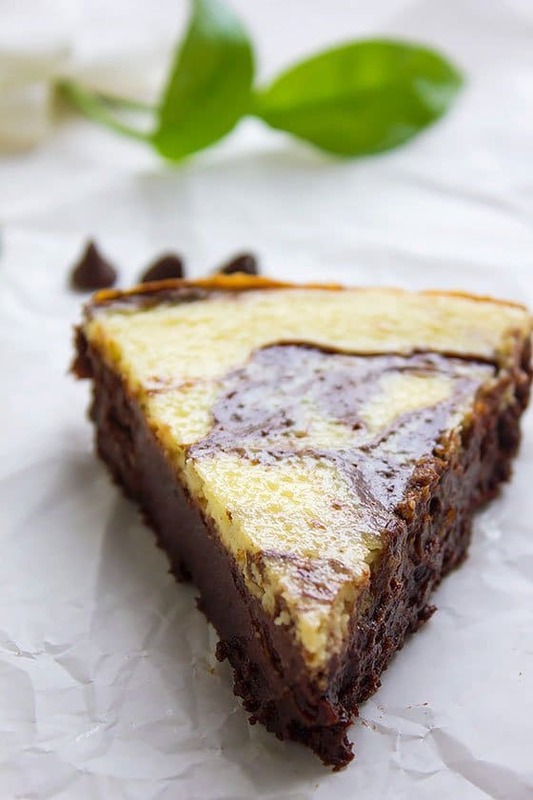 I was trying so much of eggless brownie recipes and all didnt work for me. BUT your one is the only one gave me the best ever brownies. Thank you for your effort and been that generous to share the wonderful recipe. Dear Munaty i did add few chocolate pieces to the mixure because I like the chocolate taste and is there anyway I can make it more fudgy than this. 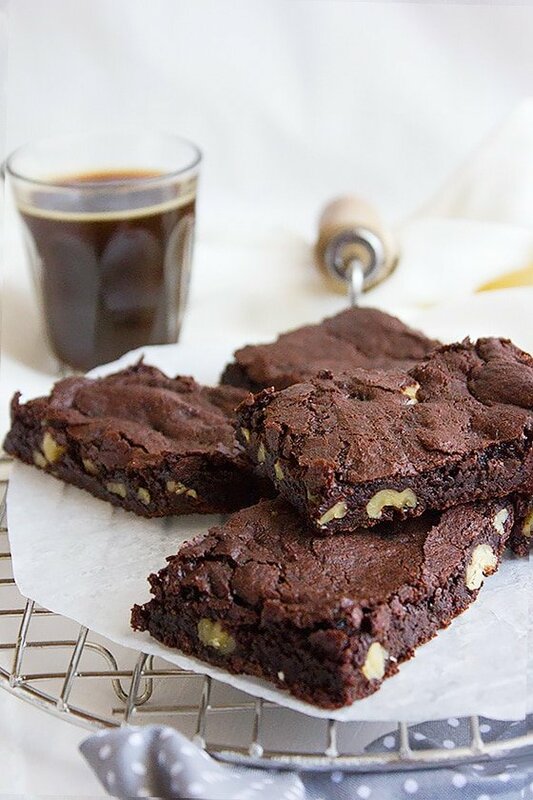 THANKS once again for sharing this wonderful recipe I used apple puree as you suggested instead of Banana because i dont like the banana flavour in brownies. It came out heavenly. There are no eggs in this recipe hence the baking powder. If you reduced the amount of the baking powder the brownies will be flat.